Chocobo’s Mystery Dungeon: Every Buddy! 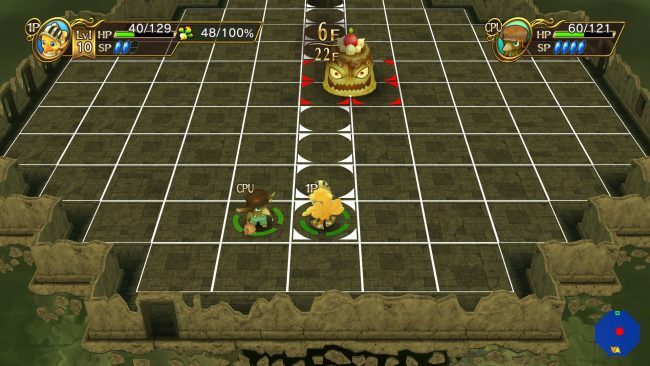 is a remastered version of Final Fantasy Fables: Chocobo’s Dungeon, a Wii game from way back in 2007. It’s a spin-off from the Final Fantasy series, and so features lots of familiar monsters, an awesome soundtrack, and the instantly recognizable, bright yellow bird, Chocobo, as the main protagonist. The game is a challenging and surprisingly addictive roguelike dungeon-crawler. It all starts with Chocobo and his treasure hunting friend, Cid, trying to liberate a mysterious artifact from a tower in the middle of the desert. Of course, nothing is ever that easy and, after bumping into a couple of rival hunters, they all get sucked into a vortex and end up in a strange town called Lostime. The townsfolk that you first meet all come across as being part of a weird cult, as they all talk about how forgetting everything is a good thing and oblivion is bliss. You’ll soon realize what they’re talking about after the bell-tower in town starts tolling and you see Cid lose some of his memories right in front of your eyes. Chocobo, being the adorably courageous hero that he is, decides to help everyone out. With the aid of a human baby who mysteriously hatched from an egg, Chocobo can travel into labyrinths formed from people’s shattered memories. 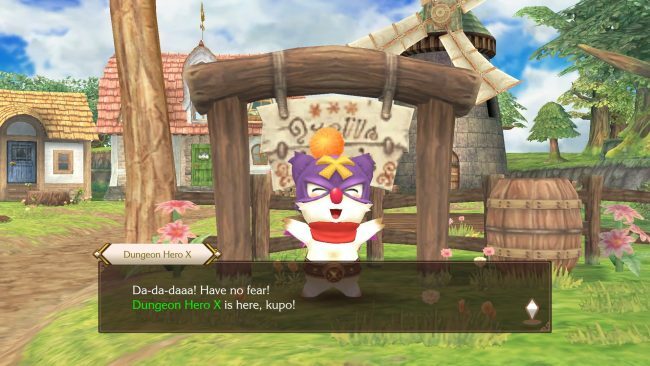 The story is the typically bonkers stuff that you’d expect from a JRPG, but it’s all told with such a huge amount of endearing charm and humor that you can’t help but be transfixed by it all. The majority of your time in Chocobo’s Mystery Dungeon: Every Buddy! will be spent traversing through the many dungeons. Every floor is randomly generated, and enemies will only move when Chocobo takes any kind of action. The gameplay is deceptively simple to begin with, but if you rush in, then you’re going to find yourself in trouble pretty quickly. It’s really easy to get a bit too cocky, running around a dungeon floor and picking up loot, only to wind up stuck in a trap surrounded by enemies. Many traps aren’t even visible until you step on them and can have a wide range of different effects, from inflicting a negative status ailment, to warping you to a different part of the map or even alerting any nearby monsters to your presence. They aren’t all bad though, as some traps can restore health or whisk you away to a merchant so that you can top up your supplies. There is plenty of loot strewn around the dungeons, but Chocobo’s Mystery Dungeon: Every Buddy! adds an extra little complication by not always allowing you to see what you’ve picked up. Some items will have vague descriptions, so you won’t know for sure what it is until you either use appraisal glasses to identify it or just go ahead and use it. It definitely adds a bit of tension when you’re down to your last sliver of health and you’re hoping that the glittering vial of liquid in your inventory is a health potion, not poison. 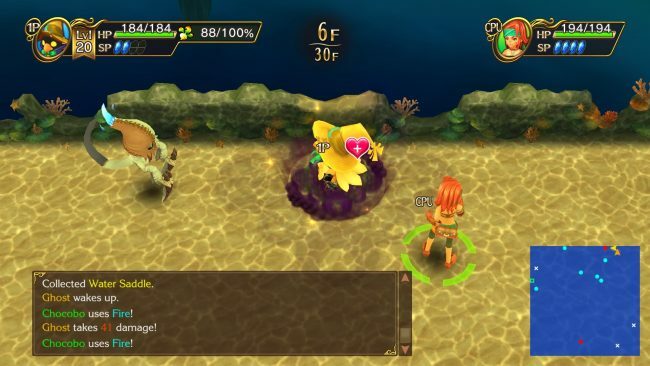 While there is definitely a bit of luck involved in Chocobo’s Mystery Dungeon: Every Buddy!, I felt like most of the times that I failed were my own fault for not being better prepared or for putting myself into situations where I was overwhelmed. Each time I died, I’d quickly find myself wanting to give it another go and try to get deeper into the depths of the dungeon. The dungeons are teeming with monsters who want to try to ruffle Chocobo’s feathers, so you’ll be needing the services of the local blacksmith to make sure that your gear is on top form. It’s a pretty simple system, but one that works really well. You can hone equipment to make it slightly stronger, or you can fuse pieces together to transfer traits onto your main kit. This can come in pretty handy. For example, in one dungeon monsters kept using attacks which rusted my equipment, causing it to become weaker. I managed to transfer over a ‘protect against rust’ trait from a low-level bit of kit onto my preferred gear. Problem solved! Chocobo is the kind of bird that wears many hats, and we mean that in the very literal sense. 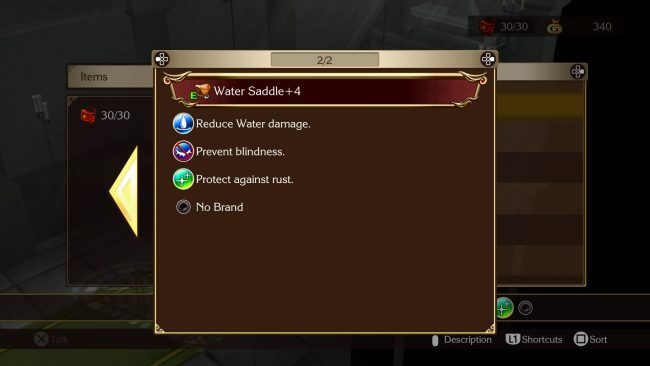 There’s a job class system that enables you to switch between many classes that will be very familiar to any Final Fantasy fans. With classes that include dragoons, knights, scholars, and mages, there is a lot to work with. Different classes have different stats and abilities, but will also change Chocobo’s appearance. Seeing Chocobo dressed in black mage garb is the epitome of cuteness. The job classes you find all start out at level one, but occasionally defeated enemies will drop Job Points that will help to level you up. While it’s great to have access to so many different job classes, it can feel a bit of a slog to have to level each one up individually. Low level classes won’t have access to many abilities, which can make them a bit tough to use unless you go through earlier dungeons to grind for points. New to this version of the game is the Buddy system. Defeated monsters will sometimes drop Buddy Points. Collect enough of them, and you can bring that monster along to fight beside you. There are loads of different monsters to befriend, and it’s pretty awesome to fight alongside such iconic creatures as tonberries, cactuars and iron giants, to name a few. The AI is fairly simple, as your buddy will stick pretty close to you and won’t use its special ability unless you tell it too. If you have a friend and a spare controller to hand them, then you can use the co-op mode to explore dungeons together. Even if you’re just relying on the AI, buddies can be pretty handy. I made great use of them whenever I was a mage. I used my buddy as a living meat shield, all while blasting off devastating spells from the safety of a corridor. It’s not all about dungeon crawling though. It’s important to take a bit of time out to relax, whether that’s doing a spot of gardening, a bit of fishing, improving your equipment or doing some shopping. Before you can do any of those activities, you’ll first have to help the townsfolk recover bits of their memories by taking part in some challenge dungeons. These are short dungeons which have specific rules. Some will inflict you with status ailments that can’t be healed, while others will pit you against large numbers of a specific type of enemy. These can seem really tough at first, but there’s a great amount of satisfaction that comes with working out the best way to tackle each challenge. It’s great that a game that many may have overlooked on the Wii is being given a new lease on life on the latest generation of consoles. 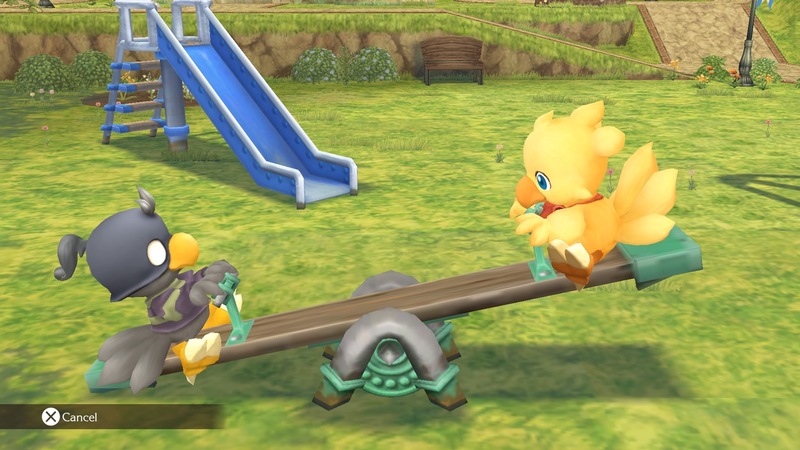 A new coat of paint and some fun new gameplay features makes Chocobo’s Mystery Dungeon: Every Buddy! a very easy game to recommend to those seeking a challenging but super adorable adventure. Chocobo’s Mystery Dungeon: Every Buddy! review code provided by publisher. Version 1.00 reviewed on a standard PlayStation 4. For more information on scoring, please read our Review Policy here.